Creating Dreamy Children’s Bedrooms in Singapore is Possible! Here’s how! With new homes getting smaller every year, it is no surprise that children’s bedrooms in Singapore are also shrinking. The good news is that Lifetime Kidsrooms products are extremely flexible. Their modular nature means that they can be configured to create that same dreamy bedroom, even when space is tight. First, here’s a little inspiration in the form of a moodboard! All items shown are from Lifetime Kidsrooms, which is a top Danish furniture brand, with over 45 years of experience in design that inspires kids to play. 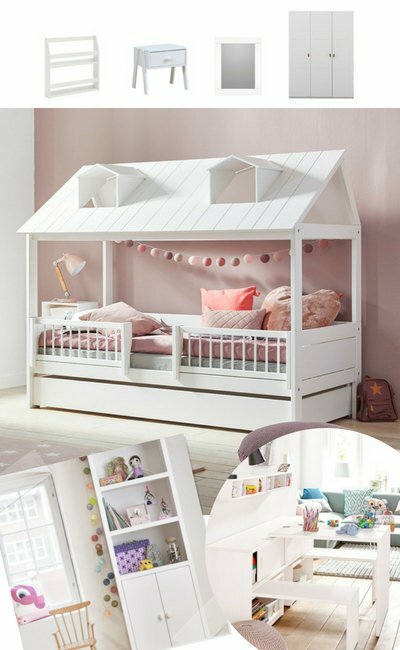 Read on to see how their kids’ furniture can be used to create the the ideal bedroom for young girls everywhere. The following arrangement is based on a room in a standard HDB apartment (resale) or condominium. The centerpiece to this wonderful dreamy setting is the Lifetime Kidsrooms’ Beachhouse Bed. This beautiful bed conjures images of lazy days by the sea – the perfect setting for your little princess to relax and play. Its adorable roof and classic style will be the envy of all of your daughters friends when they come and stay over. An important aspect to any girl’s bedroom is space. It is provided in abundance by the versatile Play & Store Cupboard. This multi-use cupboard can be used to keep her toys in or pulled out to play games on or to do her homework. Once they’re finished with, everything can be pushed away tidily, efficiently using the available room. As the name would suggest, this wardrobe is highly customisable. Whether your little girl needs a more room for clothes or for toys, it can be adapted for many purposes. Options include shelving, clothing rails or even LED lamps with motion sensors! Whatever the height or width or your available space, this kid’s wardrobe can be easily adjusted from inside. The perfect complement to any young girl’s bedroom is the Nightstand, Mirror and Junior Clover Stool set. Every young girl needs a place to put her personal things and to check she looks her best! Both night stand and mirror feature a classic design that even doubles as a place to put a table lamp. We think it’s an essential component to children’s bedrooms everywhere. Night time stories about ponies and stardust are a vital ingredient of any girls childhood. What better way to keep them ordered and tidy than the Bookrack . Even in the smallest of rooms, this nifty piece of kids’ furniture is the ideal place to keep her growing library. We understand kids have lots of jewelry, toys AND books to keep tidy. Which is why the multi-shelf bookcase can be a wonderful addition to your daughter’s bedroom. Provide enough space in your child’s room and you’ll teach them that tidy habit from an early age. This adjustable bookcase not only does that, but also completes this dreamy young girl’s bedroom scene. If you want to create the full ‘girly girl’ theme in your child’s bedroom, we suggest adding one or two pink accessories from our range. We’d Love to See You In Store! To truly understand the quality of craftsmanship from Lifetime Kidsrooms furniture, it has to be seen to be believed. It is created from slow growing pine from cold Scandinavian forests, meaning fewer knots and a highly robust construction. Not only that, but the modular design of their beds mean that they grow as your children do. You can find us at our Kids Furniture Showroom on Boon Leat Terrace, Harbourside. We’re open 7 days a week, so you can pop in and see us on a day that suits you! If you can’t find the time to see us, you can get lots of information about us, Kuhl Home, by browsing through our website. Alternatively, to speak to someone about anything mentioned here, our expert team is available on +65 68780180 for guidance on the perfect solutions for your needs. Thanks for reading our blog and we’ll see you next time!